Despite the rumors, I'm still alive. And well, to boot. I've been basking in the twilight sun in the evenings in my own Margaritaville (also known as the deck out back). When it's not twilight time I'm usually found cleaning out some cupboard that's been neglected (so that's where I hid the rum!) or attempting to train my new dog. Classes are over, at long last, and as I promised myself, I am using my summer break very unwisely. Of course, I suppose the concept of well-spent time depends on what one's priorities are. My priorities are quite simple, really. 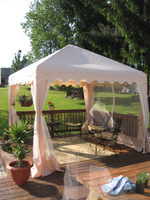 I have spent the last two weeks cleaning my house and pre paring my back deck for the onslought of friends and family that's sure to sneak by this summer. My garden is ready to be planted; hopefully I can keep the rabbits and deer out of my lettuce beds and banana pepper plants this time. 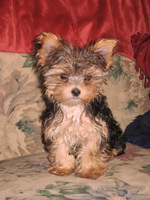 I picked up my Yorkie pup, Conner, on May 12; he is three months old and in desperate need of of training, so that's a priority, as well. And then there's the kids… My son wants to take guitar lessons. My daughter plays the flute in the elementary school band; she performed a solo in her first band concert last Thursday. She did a fantastic job. She also wants to go to basketball camp, so we'll see about that. 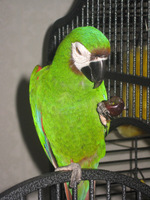 And then there's Coco, the grape-eating macaw. There are no mandatory appointments or classes, no 6:45am clinicals, no exams, no pressing deadlines. This will be the last summer of my entire life that I will be completely free… until I retire, at least. Unwisely, indeed. Then again, I feel that this is time well spent, wisely or not. I'm getting in touch with my own world. While I'm cleaning the cupboards or planting rows of green beans, I am usually deep in thought. About everything and nothing in particular. This is a season of growth for me, as it is for everything else. August 27th will be here before I know it, I'm sure. It will bring back the vast array of responsbilities and early mornings. And as usual, I'll oblige. Until then, I'm content to bask in my own little corner of the universe, my little piece of Margaritaville. Sometimes at night I hear a mysteriously familiar, distant music beyond the mountains, and I can't tell where its origins are. Then the thought crosses my mind — perhaps this is the music of my soul, the melody of my contentment.